Over the last decade, undocumented youth have participated in immigrant rights activism in unprecedented numbers, defying stereotypes of youth—especially immigrant youth—as politically powerless. This case study of DREAM Activism, or mobilization for the passing of the DREAM Act, traces young people’s use of new media to foster participatory forms of political engagement. Part of the Media Activism and Participatory Politics (MAPP) Project, this case study draws on interviews, event observations, and media content analysis to highlight two key and interrelated findings. First, new media presents a powerful way to mobilize collective action given undocumented youth’s legal vulnerability. Specifically, blogs, social media, and user-generated video facilitate the formation of networks and communities to foster shared identities. These communities and networks offer youth a space for self-expression, connection, and communication. They also facilitate the construction of alternative identities and modes of belonging, which, in turn, increase participants’ sense of self-worth and political efficacy. Secondly, this research on DREAM Activism reveals how communities and networks established through daily friendship and interest-driven use of new media can become politicized. Once politicized, they may further support more formal modes of political participation. In this way, social networks fostered through new media become sources of social and political capital. As scholars continue to debate the connections between politics and new media, this DREAM Activism case study finds that new media affordances can, and do, increase youth’s sense of political efficacy. However, this study also identifies limitations of new media in these spaces and points to the enduring importance of social movements, community institutions, and other contextual support structures. 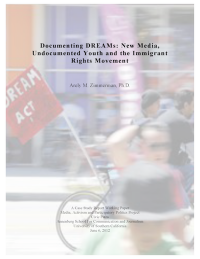 As such, this exploration of DREAM Activism provides insight into how socio-economically marginalized and politically disenfranchised youth use new media to mount and sustain a youth-led movement for immigrant rights.